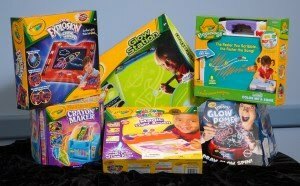 Crayola: New Products, TONS Of Glow Fun! Size: 12″ by 8″ and 3″ deep. 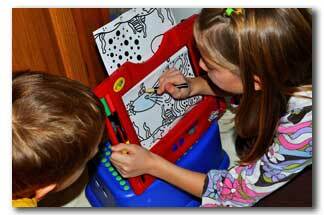 When the product is opened and set up it looks like a small easel & easily fits on table top, or can sit in child’s lap. Aha Factor: Took us a few minutes to understand how this baby works. But WOW! I promise once you realize that there are TWO coloring surfaces, and when you color a ‘changing’ image, then turn on the alternating lights… It Looks Like Your Image Is Moving!!! I don’t think I can do this product justice. I’m serious. 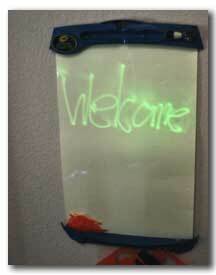 I think I’m more in love with this light/glow board/easel thing than my kids! We keep imagining new ways to use it! My 8yrold begged to take it to church for Pete’s sake! Crayola provides additional drawings and ideas on their website for download… and we’ll get to that but so far.. we are having too much fun drawing our own ‘moving pictures’…. Examples so far: A rocket taking off, a little kid swinging back and forth, and even a watering bucket that looks like the water is coming out on the flowers (leave it to my 8yrold budding artist to come up with this… but honestly my 5yrold draws some cool stuff)! Thumbs Down Thoughts: The markers are kind of flimsy. (One of ours broke outright.) It says right in the instructions these will dry out faster than regular markers. And it says you can replace them but I’m not seeing them sold separately anywhere? I found them for sale directly on the Crayola Store site for $5.99 plus S&H. YGWYPF: (yougetwhatyoupayfor) I think this is a great price overall. Perfect for a gift, and suits really any age kid from 3 and up? I saw this advertised at Micheals for $25 but elsewhere for under $20. Replacing the markers could get expensive though so that’s a bit of a downer. But the fun and learning and creativity make up for it. Aha Factor: My kids recognized the product immediately! 5yrold: “I’ve seen this on TV! Can we open it RIGHT NOW!! !” They were especially excited when they realized you can use ANY light source not just the glow wand it comes with. They ran and gathered up every flashlight in the house! They soon learned by experiment that larger flashlights deliver too much light and the whole board lights up! 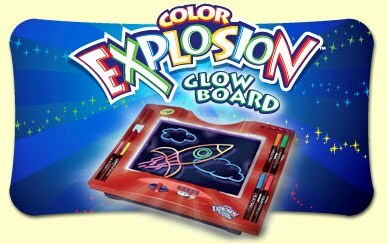 My kids love this just as much as the glow board. I’m super impressed with the ‘science’ of the thing. They are experimenting with it in a completely dark room (yes the bathroom) and in a less dark room. What happens when they flip the light on? How long do the images last in a dark room VS a lighter room? Thumbs Down Thoughts: I’m having a hard time coming up with anything we don’t like about it? You have to change the batteries?? So far we haven’t had to though. The light wand can be fitted with a prism-like tip and the light bounces around all zainy brainy.. or without it the tip is fine and better for writing. 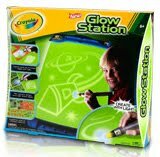 I was on the Crayola Site and they had all these examples of games to play using the Glow Station. We are all over THAT!! YGWYPF: (yougetwhatyoupayfor) I think this is fabulously priced. $20 for hours of fun and no additional cost? I call that a winner. And worth every penny. MomItForward.com is hosting a Girls Night Out via Twitter (#GNO) This Tuesday night! Join me I’ll be on the panel! @Crayola will be there to offer up more Holiday creative gift ideas! Don’t miss it…. and… YUP. Giveaways included! Wow, TONS of Crayola products and even a Kindle! Products provided by Crayola, as part of the MomItForward #GNO campaign. You are currently browsing the archives for the momitforward category.